Createspace Independent Publishing Platform, 9781537097978, 388pp. Medical student Seth Levine faces escalating stress and gallows humor as he struggles with the collapse of his romantic relationships and all preconceived notions of what it means to be a doctor. It doesn't take long before he realizes not getting frazzled is the least of his problems. Seth encounters a student so arrogant he boasts that he'll eat any cadaver part he can't name, an instructor so dedicated she tests the student's ability to perform a gynecological exam on herself, and a woman so captivating that Seth will do whatever it takes to make her laugh, including regale her with a story about a diagnostic squabble over an erection. 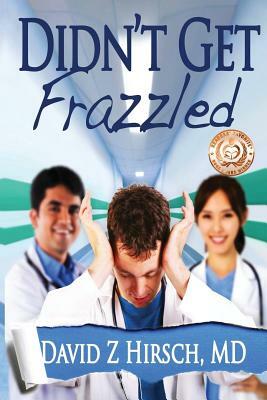 Didn't Get Frazzled captures with distressing accuracy the gauntlet idealistic medical students must face to secure an MD and, against the odds, come out of it a better human being. This comedy-drama is an exciting addition to the grand tradition of medical novels by Samuel Shem, Lisa Genova, and Noah Gordon. David Z Hirsch grew up on the steppes of Nebraska peddling Kool-Aid off I-129 until saving up enough cash for medical school. After graduation, he moved to Pyongyang to teach pre-med classes at Kim Il-sung University. He soon fell out of favor and was imprisoned at Kaechon where he traded medical favors for soup and toilet paper until he made a daring escape across the border. Dr. Hirsch subsisted for the next three years by foraging gooseberries and licking the dew off spiny toads. This led to a burst of creativity, and he wrote the first draft of Didn't Get Frazzled on bark peeled off a dying Manchurian Ash tree. Ultimately discovered in a semi-feral state by the China Coast Guard flotilla from Liaoning, Dr. Hirsch returned to the United States sixty pounds lighter but more inspired than ever. David Z Hirsch is a pen name, so absolutely nothing in the above paragraphs are true. This is not lying, you see. It's fiction. Many well-regarded sources insist that these are two distinct things. The actual guy who wrote this novel is a practicing physician in Maryland. His life story is considerably more prosaic, but in his head he lives a fascinating, fascinating life.